PUBLIC ASSET: Simon and Hayley Hills of The Coffee House at Adastral Square, Canford Heath, which has become a venue used by at least five community groups and continues to draw interest. CANFORD Heath has a new café that is putting community life at the heart of its agenda. 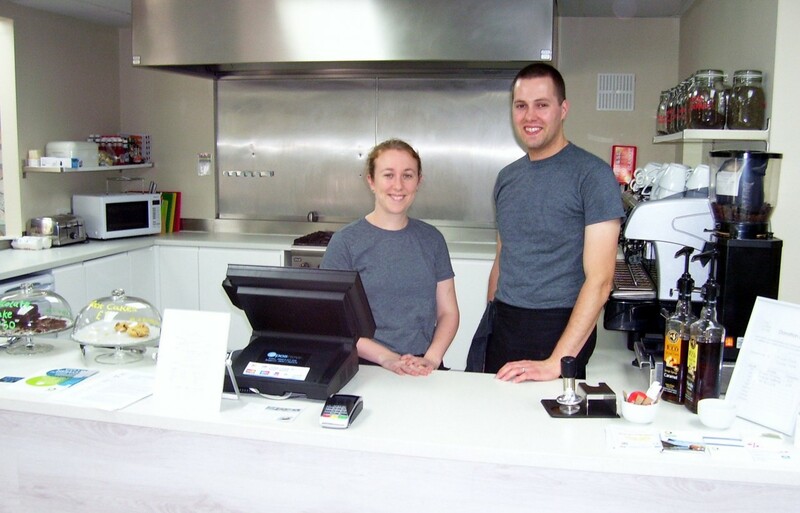 Simon and Hayley Hills took out a lease for the Coffee House in Adastral Square in January and it has firmly caught the attention of the 15,000 residents in this area of Poole. In August last year, the couple began exploring the idea of setting up a place where people could meet up informally and where community groups would also be beneficiaries too. They are part of the Community Interest Party, also known as “Community Rhythms CIC”, and this was established in November 2013. With the help of their church, family and friends, they have been up and running in no time at all. The café serves breakfast, lunch and hot drinks with cakes throughout the week and breakfast consists of sandwich of sausage, egg or bacon; pancakes with banana or golden syrup or bacon, sausage or egg with toast. Part of the lunch menu includes homemade soup of the day; a jacket potato with salad and crisps or a sandwich or baguette with a choice of fillings. As well as doing speciality coffee like latte, expressos, americanos and cappucinos; they also serve a number of conventional and fruit teas, milk shakes and hot chocolates. In the short space of time the Hills have been there, they have seen the coffee become host to groups such as the Free Household Bills Surgery; Mums on the Run; Knit and Natter; Craft at the Café as well as a gardening club and interestingly, a ukulele club. The café has now become a third community venue in Adastral Square alongside Canford Heath Library and the churches and the couple are also hoping that it will also be a place for the heath’s young people to hang out at. Simon said: “We’ve had people come and visit from outside the area to support us. We are trying to build up a sense of community and get people to come and see what is going on the Heath. “The NHS use us and other businesses have been very welcoming and helpful. We are hoping to restore a flower bed and are going through Poole Borough Council and local community and at the right time it will be bringing people in. “We are a not-for-profit organisation with the aim that any profit generated is reinvested back into the community. The café is the starting point, not the ending point. “As you can see we have other things going on, including the community allotments. We have a waiting list for volunteers of 10 and more and another five have requested application forms. Brilliant warm friendly coffee shop.